Rasmussen released 10 new polls today. Unfortunately, some of these polls raise a methodological issue. The Rasmussen polls were taken in the period June 1-30. The policy of this site is to use the most recent polls. This brings up the question of whether a June 1-30 poll is more recent than, say, a June 10-12 poll? What about a June 15-18 poll? We have resolved this in favor of using the middle dates to determine which poll is most recent. Thus polls whose middle date is on or after June 15 are considered more recent than a June 1-30 poll. For the record, Rasmussen does not include Nader in his polls, even though Scott Rasmussen is a Republican and including Nader makes Bush look better. Oddly enough, John Zogby, who is a Democrat, does include Nader. Our policy is to include Nader for the time being where a choice is available (some of the independent pollsters ask two questions--one with Nader and one without). The effect is to make things look better for Bush than they really are. The Rasmussen polls that have not be superseded by newer polls are in Maryland, New York, and Oklahoma. 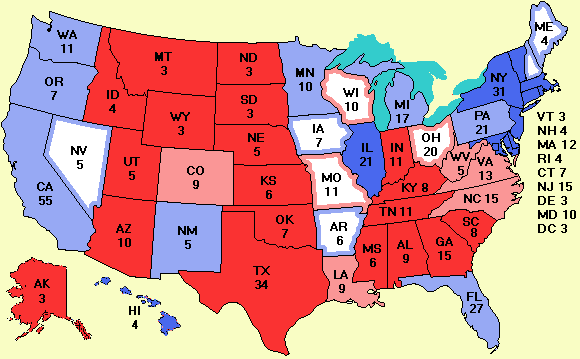 The first two are still solid Kerry states and the latter is still a solid Bush state. All of today's polls were done before Edwards was selected. The format of the Excel spreadsheet has been improved in several ways, the most important of which is indicating today's polls by putting the date in yellow.